n DEVELOPER: Goldland Properties – developer of Almanza Metropolis, Metro East Townhomes, CEBU Hilton, Goldland Plaza and Goldland Tower, etc. - Studio – 18.82 sqm. And 24.10 sqm. 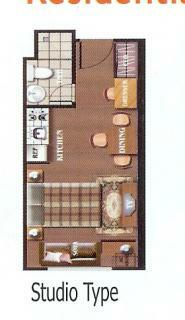 - 1 bedroom – 33.90 sqm and 41.74 sqm. - 2 bedroom – 47.72 sqm. NOTE: Sample computations only. Prices increase as the floor of the building go higher. Floor area 24.10 sq. m. 41.74 sq. m. 47.72 sq. m.
a) 5 years to pay at 16% interest P15,902.84/mo. P27,634.28/mo. P31,593.39/mo. b) 7 years to pay at 18% interest P13,744.79/mo. P23,884.26/mo. P27,306.10/mo. 36 mos. to pay at 0% interest P28,257.25/mo. P49,102.47/mo. P56,137.28/mo.